When you need software to do a specific job, little else comes close. You want to quickly visualize a concept; illustrate a point; diagram a plan? Use your finger! Instaviz 2.0, a major rewrite of the first and best iOS diagram sketcher. Users can sketch, refine and share their diagrams, mind maps, flowcharts and concept maps even faster and easier on the new version. The developer has revamped the user interface with clean, modern graphics, scrub-through settings, a thumbnail graph list and help demo videos. I've always seen Instaviz as an extension of my mind... When I have an idea or relation in my head, I want to get them down quickly without fussing about where to place them, or getting stuck in endless popups and modes. In obsessively pursuing that seamless experience for all users, I've rebuilt the app from the ground up over 4 1/2 years to create this new version. 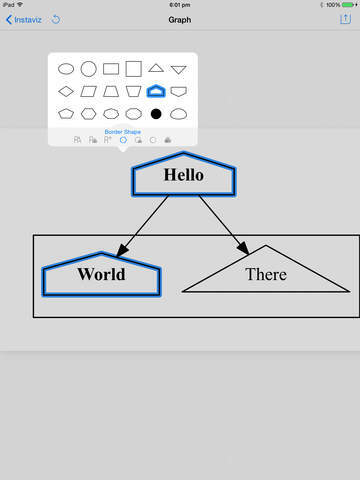 First released in December 2008, Instaviz became one of the most popular diagramming software on the iOS platform. Enthusiastic users have purchased over 17,700 copies and awarded it 3/5 stars on the App Store. The app also regularly makes it to the Top 100 Business Apps list on the store. Users start by sketching some rough shapes, typing in some text then linking them together. Instaviz neatens the shapes and arranges them elegantly as the users work, turning them into beautiful diagrams. Next, they can refine their ideas with different fonts, colors, styles and shapes. 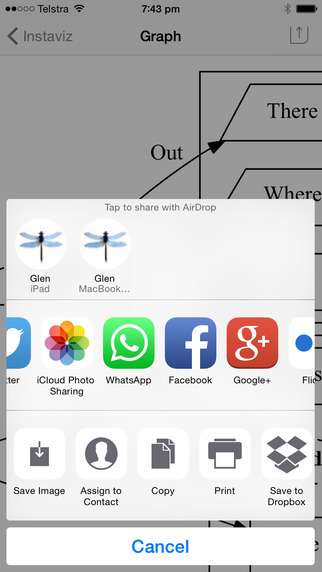 Then, they can share their work in different formats through email, message, print, AirDrop, Facebook, Flickr, Google , Pinterest, Twitter or WhatsApp. Here's what I like about it ... I don't have to worry about picking tools to draw the various shapes. I have a tool right here: it's my finger! Stephen Northcott from Touch Reviews gave Instaviz 4 out of 5 stars. Instaviz's impressive strength is the way that it intelligently rearranges your flowchart for an optimal layout on the fly. Watching boxes and lines reorganize when you've got your flowchart into a jumble, by not planning ahead sufficiently, is quite cathartic. Supported Languages: Instaviz supports English, Chinese (Simplified), Chinese (Traditional), Dutch, French, German, Italian, Japanese, Portuguese, Spanish and Swedish languages. Pricing and Availability: Instaviz 2.0 is $7.99 USD (or equivalent in other currencies), available worldwide exclusively through the App Store Productivity category. Existing users can upgrade for free. Perth, Australia - Pixelglow Software synthesizes disparate ideas into simply powerful yet intuitive working software. On the Mac OS X, iOS, Windows and web platforms for over 15 years, Pixelglow Software works with clients ranging from small firms to multinationals like WorleyParsons and AT&T. Their port of Graphviz to Mac OS X took two prizes in the Apple Design Awards 2004: Winner for Best Open Source Product and Runner-Up for Best New Product. Copyright (C) 2015 Pixelglow Software. All Rights Reserved. Apple, the Apple logo, Mac OS X, iPhone, iPod, iPad and Macintosh are registered trademarks of Apple Inc. in the U.S. and/or other countries. Terry White sez : "I have a tool right here: it's my finger!"